Google Glass is no longer on the horizon having been released to the general public in May this year. Google Glass operates a bit like your smartphone, but with your head up and your hands free. It is voice activated and can display information to the upper right of your field of vision. Are wearable technologies hype or will they become part of our reality? What does this mean for policy? This forum will introduce wearable technologies (computers) and explore issues for their use in education and will also touch on other applications. Since its incarnation, Google Glass has made such a huge fanfare online particularly inside the education circles. There has been a lot of talk on the usability of this innovation and its impact on the learning and teaching. Educational Technology and Mobile Learning has been in the loop of this discussion and has also a detailed visual guide on the potential of Google Glass in education. Check it out to learn more about this innovative technology. 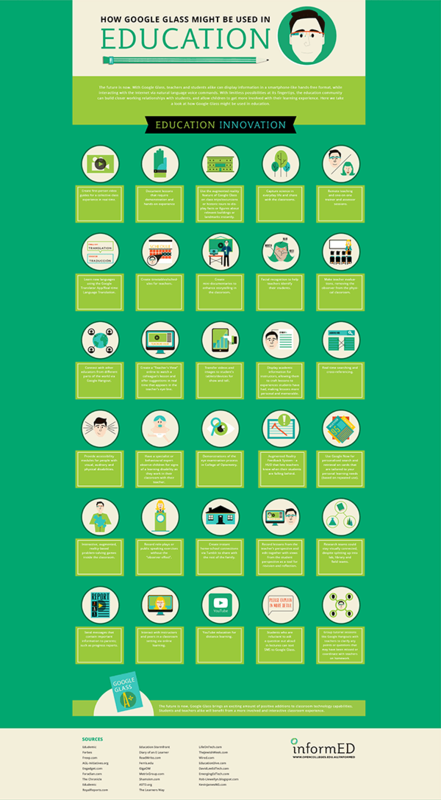 Informed has recently created this awesome info-graphic featuring 30 ways Google Glass might be used in education. Glass could be used for recording lectures, live streaming them for remote access, audio-note taking and supplementing lectures with related data. Glass could potentially aid those with learning disabilities and those with certain visual, auditory and physical handicaps. Glass opens up new possibilities for teaching people things from a hands-on, first person perspective. Ex. Fixing things, cooking meals, learning to play the guitar. No wonder Google Glass has wide exposure and with technological advancement will play/make Education more advanced in coming days. Alos Read : How Inspiria is Transforming Education through Technology!